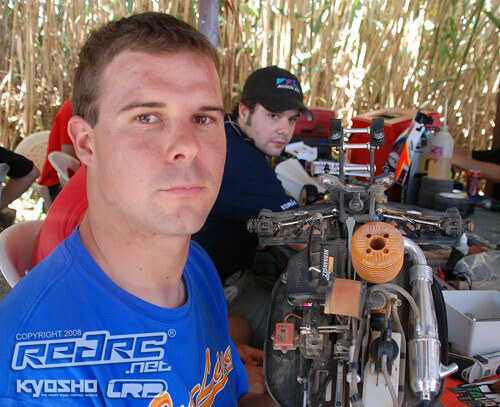 Spanish star Borja Hernandez has topped the time sheets here in Crete as Day 2 of the 2008 EFRA European 1:8 Buggy Championships gets underway. The Hobao driver was fastest from young Team Losi hot shot Darren Bloomfield by just over one second at the end of the timed five minute run. Hernandez was pleased with is run and only plans to try Proline XTR over the M2 he ran in the first practice. Bloomfield was also happy with his run and will too just try different tyres for Practice number 2. 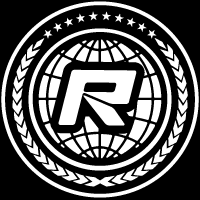 Running Losi Eclipse Red Compound tyres, the British racer will run a softer insert next time out. With five different manufacturers in the Top 5 places it was the Bergonzi R1 Prototype of Raul Peris who recorded the third fastest run. The Spanish driver said the track is very difficult but his car is running well and he only plans a few suspension changes. Hupo Honigl was next up with his LRP S8. The Austrian said his run was not so good but he is happy with the overall time. Honigl is another who will try different tyres for the next outing with both XTR and Hole Shots ready so he can make the call just before his Group go on to the track, which again has come in for a lot of criticism from the top drivers. Top Mugen is Daniel Vega with the fifth fastest time. The Spaniard will experiment with different tyres next time out but plans no changes to his car. Running the Ninja engines, Vega is running a GRP pipe here this weekend as the new EFRA spec Ninja pipes did not arrive on time. 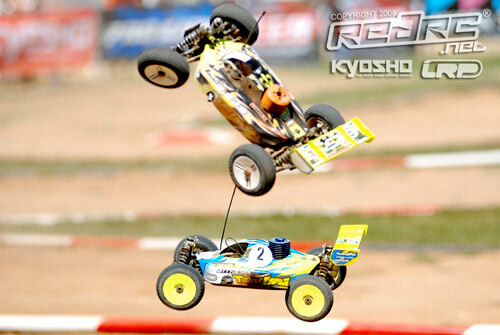 Heading Xray’s challenge is France’s Jerome Sartel in eight while Swede Linus Thern is the fastest of the Kyosho drivers. Sartel will change the springs on his 808 as he tries to get the car to work better over the increasing bumps. Thern plans to run a front torsion diff on his MP777 having run the standard diff in the first run. He had used the torsion diff at the Warm up race and he feels it should improve traction. 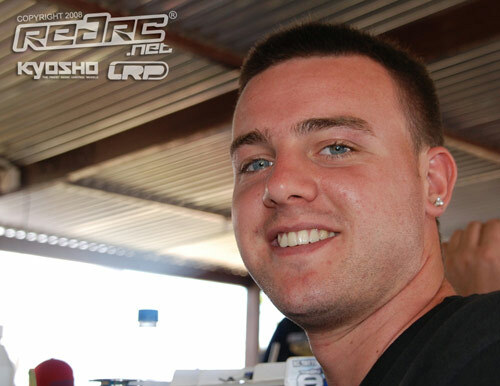 Team mate Daniel Reckward, currently in 18th, ran as truggy clutch this morning and found a big improvement in traction. The man behind Reckard Tuning is using a Speed 2.5 Extended clutch and has switched from carbon to aluminium shoes. The German, together with Sartel and Thern will run a second RB engine in the second run to have it ready should he hit any problems later in the event. All three are also running RB’s 3003 pipe which is originally designed for On Road use. The power appears to be smoother with the pipe but at the expense of a slight fall in fuel economy. Richi Gomez, who made a last minute switch from GS to Hong Nor in the lead up to the Euros, is very happy with his new car. This is the young Spanish drivers first race with the car and compared with his previous GS Buggy he is very happy with the X1CR which he says turns in better and also has more traction. Gomez will try a harder Panther tyre and stiffen the rear diff for his next practice. Here is the complete ranking after Practice Round 1 (PDF). Thanks to Aebi RC progress for providing Red RC with the results. Check out our event image gallery here. The opening day of the 2008 EFRA European 1:8 off Road Buggy Championships has come to a close and as the dust settles here in Crete the drivers had little to report as they eased themselves in to the event over the single 15 minute practice session that made up today’s timetable. The track was the biggest talking point today with many of the top drivers saying the surface was their main concern. It would appear from drivers who took part in the Warm up race earlier in the year that the track surface has remained largely untouched since that event. One interesting story in the pits is Joesph Quagraine is back running a Habao 8.5 that has been given the JQ touch with a number of modifications, the biggest of which is the placing of the receiver over the steering servo. 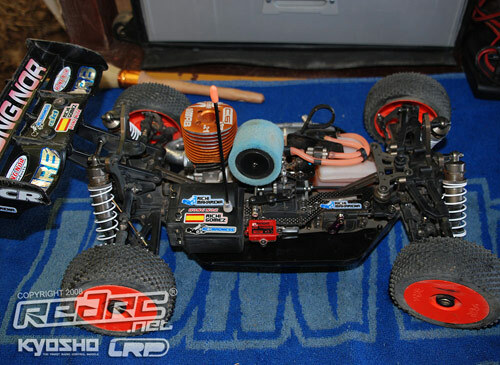 Quagraine is also running his own shock towers on the car along with JQ Products lower suspension brackets. Two times European Champion Davide Tortorici said after his run that his car was OK. The Crono team leader has reverted to standard kit shocks saying he prefers them to the prototype big bores and the Italian is also running a new front shock tower on his RS7. 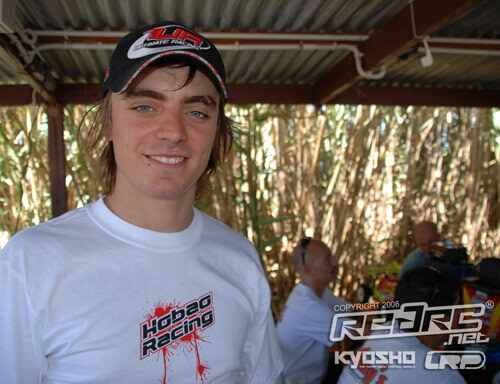 Top Kyosho driver Daniel Reckward said his first run went off OK but said while the track looked easy it was in fact quite challenging mainly due to the surface conditions. The German will make some changes to the diffs on his MP777 for tomorrow’s timed practice. Top British driver Neil Cragg had a steady run but was another who reckoned the track is not as good as the Warm-up. 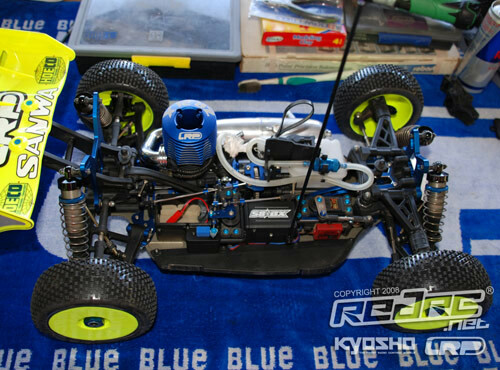 The leading Team Associated runner now has Big Bore shocks on his RC8, which he didn’t have at the Warm-up, and is running new V2 Proline wheels which he says smooth the car out over the bumps. American star Richard Saxton has crossed the Atlantic to support the Associated team and was busy in the pits giving driver tuition to one of the team’s top drivers on the best lines to take. Adrian Bertin is here supporting Team Orion drivers running the new CRF .21 engine and is also mechanic for electric touring car ace Teemu Leino. After the Finn’s run Bertin said the Xray/Orion combination was working really well and Leino was putting in really good lap times. Asked by Red RC about the dust levels, Bertin told us this is normal for off road saying ‘welcome to Buggy racing’. Drivers will start Day 2 of the 2008 Euros with two timed runs tomorrow which will determine the reseed ahead of the first qualifying round in the evening. 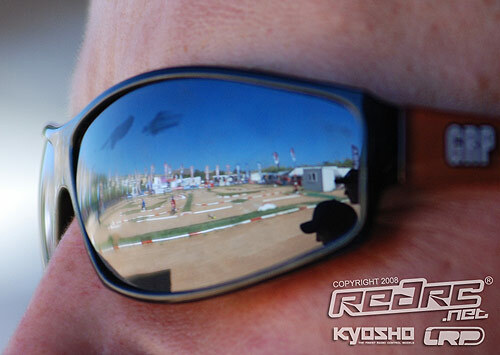 We will bring you more coverage, which is sponsored by Kyosho and LRP, throughout the day. 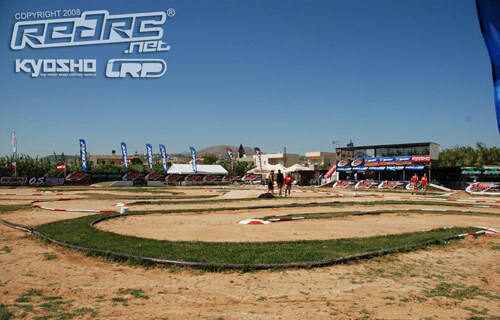 The final countdown is under way here in Crete for the start of the 2008 EFRA European 1:8 Off Road Championship with the sunshine beating down on the IMC track. The whos who of European off road are here and they are all looking to get their hands on the title currently held by Robert Battle. The young Spaniard is looking forward to the challenge of trying to retain his crown here on the Greek Island but is a little concerned over the small pebbles coming through the track surface. A concern raised by many of the drivers here. In terms of new parts on his GRP Hobao a slighted revised body shell is the only significant change. The biggest news here is the all new Serpent prototype car that Joern Nuermann is running. The German who has tested the car already and says it a major step forward on the previous prototype and appears very confident that it will show well here. Unfortunately the car is being kept under wraps for the moment. Other product news from around the pits includes new big bore shock from LRP which are being run on Hubert Honigl car and leading Mugen driver Daniel Vega is trying some lightweight parts on his Mugen. News from the Kyosho team is that they will stick with the tried and trusted MP777. 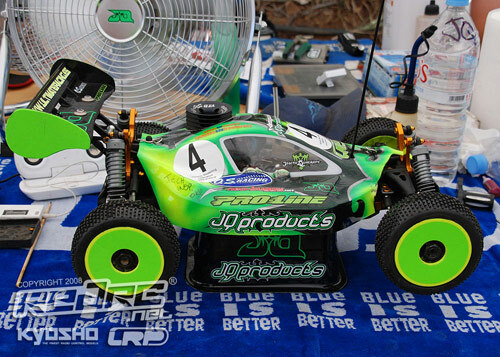 No MP9 will run as the car that won the recent Kyosho Masters was the C prototype version of the new car with a few small changes planned for the production model. The first free practice run is due to get underway in just under an hour after which we will bring you the drivers first impression of the track as they settle themselves into the event. The best 1/8th scale buggy drivers in Europe are converging on the Greek island of Crete this week to battle it out on the fast and tricky IMC Club track in Iraklio and see who will become the 2008 European Champion. Robert Batlle will be of course be there to defend his crown, won last year in France, and he is up against some strong competition with the top factory teams pulling out all the stops to try and wrestle the title away from the Spanish Hobao driver. Red RC reporter Oisin O’Briain will be present all week reporting live trackside, bringing you our usual blend of quality reporting, photographs and interviews from this exciting event. Baring any last minute hiccups, the reporting will begin Tuesday afternoon and carry through to Saturday’s main final. We would like to take this opportunity to thank our sponsors for the event, Kyosho and LRP, without whose support this would not be possible.